3 August 2012 – A coalition of Roma rights NGOs has called on the Montenegrin government to provide adequate housing solutions for some 850 Kosovo Roma refugees, who have become homeless following of a fire, which destroyed large parts of a refugee camp at the outskirts of the Montenegrin capital Podgorica. The camp had been set up in 1999 in order to accommodate several thousands of Kosovo Roma, who were expelled from Kosovo, in the aftermath of Kosovo conflict. In their letter, the NGOs recognised that Montenegro had been very generous, when accepting to take in these refugees, who had no other place to go. However, they argued that the continued existence of the camp, thirteen years after its creation, had become tantamount for the Montenegrin authorities’ unwillingness to provide a durable solution for the Kosovo Roma and integrate them into society. The NGOs criticized the grossly inadequate living conditions in the camp, characterised by the absence of running water, electricity, and sanitation, and the situation of permanent overcrowding. They reminded that fires have been a frequent occurrence in the camp and expressed surprise that no preventive measures had been taken to avoid these fires to spread over the entire camp, which hosts more than 1,300 people. The NGOs reminded that the conditions in the camps had been criticized by international organisations, which asked for their rapid closure. They mentioned, in particular, a recent report by the European Commission against Racism and Intolerance (ECRI), which criticized the situation of de facto segregation of the refugees and asked for their relocation in standard housing, in other parts of the town or country. Taking stock of this criticism, the NGO criticised a project, which has recently been granted the support of the European Commission, who will contribute 2,5 million Euros to its realization. It consists in the creation of 90 housing units and a community centre in the area of the camp, which has been destroyed by the fire. The NGOs argued that this project will only perpetrate the ghettoisation of the refugees and their isolation from the remaining society. Regarding the current situation, created by the fire, the NGOs said that the refugees should be provided alternative housing at the earliest possible date. They argued that this should happen before the end of Summer, in particular for those families with school-going children, in order to allow the children to be enrolled in a new school. They said that while the accommodation of the refugees under tents was acceptable as an emergency solution it was not made to withstand for several weeks and eventually months, as currently envisaged. They also criticized the planned relocation of the refugees in containers and asked for the refugees to be provided individual or family housing. The NGOs said that the handling of the emergency situation, which was created by the fire, had only served to reinforce their fears regarding the lack of willingness of the Montenegrin authorities to integrate the Roma refugees in society. They said that the refugees might ultimately be faced with the choice, either to continue living in barracks and cardboard shacks or to return to Kosovo. The NGOs asked the Montenegrin government to revise their housing projects and involve the refugees in its. They also asked the refugees to be compensated for their personal losses as result of the fire and suggested that parts of the money collected via the emergency fund could be used for this purpose. 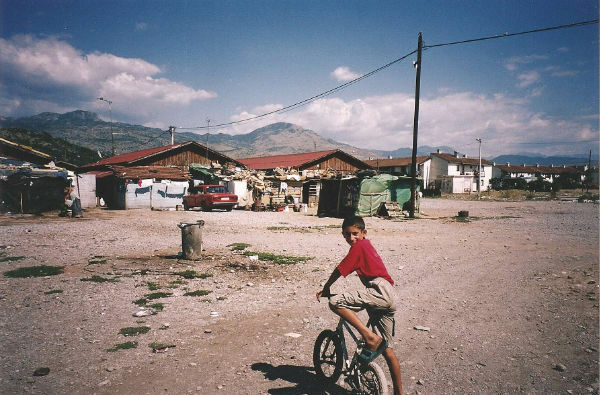 9 July 2012 – Thousands of Kosovo Roma are still living as refugees in neighboring Serbia, Macedonia and Montenegro, where they face the prospect of permanent statelessness, poverty and social exclusion. Whilst the 1999 war in Kosovo is ancient history for many people, this is not the case for thousands of Kosovo’s displaced Roma. Unable to return to Kosovo, or scared to do so, and mostly refused asylum status in neighbouring Macedonia, Montenegro and Serbia, where they have sought refuge, they live in dire poverty and face the risk of permanent statelessness. Estimates put the number of Roma, Askhali and Egyptian refugees from Kosovo in Serbia at 22,000 to 40,000; whilst there are some 3,000 in Montenegro and 1,200 in Macedonia. Life in refugee camps, illegal settlements or in rented accommodation is difficult, jobs and money are scarce, and the help they get from state governments and humanitarian organizations is scant. Redza Pajazitaj, 41, a former resident of the Kosovo municipality of Istok, has lived in the Konik refugee camp near Podgorica, Montenegro, for 13 years; a camp he shares with some 1,500 of his compatriots. “We manage somehow here. Even if there is no job, if you go to the dumpsters you will find some piece of bread,” he said. “People here do not throw old food in the dumpsters but leave it beside them, because they know that our Roma use this bread to feed their children,” Pajazitaj remarked. Life may be grim in the camps, but many are too scared to return to Kosovo. During the Kosovo conflict, Roma were seen as allies of the former Serbian regime by Kosovo’s ethnic Albanian majority. After the Serbian authorities withdrew from Kosovo, many Roma fled, and they fear reprisals if they return. “My son was three months old when we fled from Kosovo. Now he is 13. If I took him back to Kosovo, he wouldn’t know where he was, and all my other children were born here,” Pajazitaj explained. He says he is better off in Montenegro, where he takes pride in watching his seven children go to school, thanks to the Red Cross. He provides for his family by unloading trucks when needed – a paid, unsteady job, he says. “But at least there is some work here. In Kosovo there is nothing for me,” he added. Although the authorities in Serbia, Montenegro and Macedonia would like the Roma to return to Kosovo, they are bound by the Geneva Convention on refugees and cannot expel them. In the meantime, they remain without proper papers, regulating their status in the countries where they have taken refuge. They also lack access to education and healthcare services as well as proper accommodation. Redza is one of them. Left to the mercy of local humanitarian organizations and some state help, he is trying to obtain asylum status in Montenegro so that he can continue building a new life there. Mohammad Arif, from the UN Agency for Refugees, UNHCR, in Macedonia, explains that after 13 years, either the return home of these people – or their integration into the countries where they now live – is complicated. “Their problems are not easy to solve. Some serious security issues need to be solved first, so these remaining cases are always tough,” he says. “Konik camp presents apoor image of Montenegro, and representatives of the international institutions are well aware of that,” says Zeljko Sofranac, director of the Montenegrin Bureau for the Care of Refugees. Montenegro’s plan is to attract some of that money to its own proposed national housing programme for Roma refugees. The idea is to build more than 1,000 housing units, either by providing prefabricated houses or by providing construction materials to those who have bought land. The total cost of the project is estimated at over €27m, to which Montenegro would contribute approximately €4m. Sofranac says that the proposed voluntary return of around 500 refugees to Kosovo remains highly problematic, so most of them will probably have to be integrated into Montenegro. “Voluntary return is the best way of solving refugees’ problems. But the only cooperation we receive in Kosovo on this is with local authorities,” he says. “Kosovo’s government, probably with the support of some powerful higher echelons, doesn’t want to fulfill its international obligations in this regard. Musa Demiri, from Kosovo’s Labour Ministry, says his country is ready to help returnees. “When it engages in the accession process with the EU, it will have to meet those obligations, but that’s not satisfactory for us because we have to act now.” But Demiri admits that with a very high unemployment rate in Kosovo, they cannot guarantee that returnees will find any work or a sustainable livelihood there. “All Kosovo citizens have to be treated equally, and as a ministry we have no special programmes for refugees and returnees,” Demiri says. While some Roma refugees in Montenegro at least feel hopeful, NGOs and Serbia’s own Commissariat for Refugees admit that many Roma refugees in Serbia are in a worse position. Serbia treats Roma from Kosovo as internally displaced persons (IDPs), but a problem is that many Roma cannot prove that they are from Kosovo and hence cannot access welfare services. “Since most of the Roma who fled from Kosovo did not have IDs while they were in Kosovo, when they came to Serbia they could not gain the documents that other internally displaced people from Kosovo have got,” Jadranka Jelincic, head of the Open Society Foundation – Serbia, explains. Regular IDPs from Kosovo receive different levels of state aid, including monthly allowances of around €80. However, this kind of help is blocked to these Roma because of lack of proof that they actually come from Kosovo. Although there are no official statistics, the Commissariat for Refugees estimates that about 22,500 Roma from Kosovo have taken refuge in Serbia. NGOs say the real number is much higher, at about 40,000. Most are situated in and around Belgrade. Usually having no documents and living in informal settlements, they are frequent victims of forced evictions and have to move to other informal settlements, collective centres, or return to Kosovo. They are also often hindered from obtaining legal counsel. Djurdjevic and other Serbian officials insist that some Roma are “abusing” the fact that the city provides accommodation to Roma who possess documents proving that they have resided in the capital for more than five years. “We’ve helped many of them to find accommodation, and those who refused what we offered left their settlements voluntarily,” he maintains. The Commissariat for Refugees also believes it would be “unfair” to local Serbian Roma, who also face housing problems, if those from Kosovo obtained permanent housing in the capital. According to the Macedonian Ministry of Labour, Macedonia has some 1,200 Kosovo Roma on its territory. Human rights activists say that only some of the refugees receive proper treatment in Macedonia, as laid down in the 1951 Geneva Convention. A recent report by the international human rights watchdog Amnesty International says that Macedonia’s Ministry of Labour and Social Welfare has “failed to provide them with the financial assistance and housing required under the 2010 local integration agreement”. That year, Macedonia took over responsibility for the Kosovo Roma from the UNHCR, promising to provide a path to local integration for those who wished to stay. Davor Politov, spokesperson for the ministry, admits that they are helping only a portion of those people, who have obtained refugee or asylum status. “We are providing social welfare, paying health and social insurance contributions and paying [housing] rent for some 780 people from Kosovo who wish to stay here,” Politov says, adding that the country is also trying to find them jobs. Macedonia gives 2,150 denar, (some €35) a month in welfare to each Kosovan refugee, he adds. The Luxembourg-based non-profit organization, Chachipe, which tackles the human rights situation of Kosovo Roma across the Balkans, says that the situation of some 260 Roma refugees in Macedonia remains a concern. “The situation of refugees in Macedonia has deteriorated considerably following the transfer of responsibility from the UNHCR to the Ministry of Labour,” says Karin Waringo, from Chachipe. After being rejected for asylum, they are now left without any status, stateless, and in dire need of assistance. “Based on our calculations, more than 20% of the refugees have left Macedonia under financial pressures. Some went to Western Europe, where their chances of getting asylum on the basis of the persecution they experienced in Kosovo are slim,” Karin asserted. The local branch of UNHCR says it has limited resources to help this group of people, but they insist they at least provide them with legal help. UNHCR financial aid for these people stopped in 2010 due to a lack of funds, they say. “Some of them wish to return to Kosovo and we are considering ways to provide them with housing there,” explains Tihomir Nikolovski, Legal Officer at UNHCR Macedonia. “We are also helping some to get Macedonian citizenship, as they have meanwhile established ties with the local population through marriages and are thus eligible,” he adds. 28 February 2012 – The European Commission has put forward procedural arguments in order not to address human rights concerns in relation with the measures imposed on the countries of the Western Balkans in order to curb the number of asylum seekers in the EU. In its reply to the questions raised by NGOs, the European Commission stated that “all relevant issues at this stage have been considered” and announced that it would discontinue correspondence. The NGOs addressed a first letter to Commissioner Cecilia Malmström in charge of Home affairs, in October 2010, following media announcements according to which the Commissioner had written to the governments of the countries of the Western Balkans requesting them to reduce the number of asylum seekers in order to avoid a reintroduction of visa requirements. The NGOs objected that this request was contrary to basic principles of international human rights principles such as freedom of movement and the right to asylum protected and asked the Commissioner to recall her letter. The NGOs resumed correspondence following the publication, by the Commission, in May, of a proposal aiming to introduce a “safeguard clause” into the visa-free regime with third countries. If adopted by the European Parliament, which has to vote on it in April, this clause will enable the EU to temporary reintroduce visa requirements for citizens of third countries, which have been previously granted a visa waiver, in case of a major affluence of asylum seekers or an increase of undocumented immigrants. The NGOs provided a detailed account of the measures, which had been taken by the countries of the Western Balkans in order to diffuse pressures by the EU Commission and individual member states regarding a possible reintroduction of visa requirements. They argued that some of these measures such as the temporary revocation of passports and other forms of travel bans result in an infringement of European and international human rights standards. The NGOs pointed out the discriminatory character of these measures which target essentially members of ethnic minorities and criticized the stigmatization of Roma as bogus asylum seekers. Similar answers were also given to MEPs asking the European Commission to justify its “undue pressure on the Balkan countries” compelling these countries “to violate the human rights and fundamental freedoms of a particularly vulnerable social group” and to comment on the compatibility of the travel restrictions with the relevant EU acquis and, more generally, international human rights standards. “The Commission is not competent to decide on individual cases, as referred in the question.” the Commission said laconically in its answer to a question by MEP Barbara Lochbihler, specifying however, that the Commission paid particular attention to the existence of legal remedies. With its decision to discontinue communication with the NGOs, the European Commission has also deprived the NGOs from relevant information at the very moment, where the visa liberalization is debated in the European Parliament. Chachipe as the initiator of the correspondence considers this as unacceptable. The organization has filed a complaint with the Secretariat General of the European Commission arguing that the attitude of the European Commission of not answering legitimate concerns raised by NGOs was against the principle of good administrative behaviour. Brussels, 27 February 2012 – “In many European countries Roma and Travellers are still denied basic human rights and suffer blatant racism. They remain far behind others in education, employment, access to decent housing and health. Their average life span is shorter and infant mortality rates are higher compared to other groups”, said the Council of Europe Commissioner for Human Rights, Thomas Hammarberg, releasing today the report “Human rights of Roma and Travellers in Europe”. The report is the first comprehensive overview of the human rights situation of Roma and Travellers in all 47 member states of the Council of Europe. The Roma and related minority communities constitute Europe’s largest and most vulnerable minority. It is shown that anti-Gypsyism continues to be widespread. Public leaders, media, and extremist groups who are active on the Internet have openly singled out Roma and Travellers for hate speech. In some cases, these words have been understood as encouraging violent action. The report focuses on specific themes, such as anti-Gypsyism; racially motivated violence; conduct of law enforcement and judicial authorities; forced sterilisations, removal of children from the care of their biological parents; economic and social rights; statelessness, and freedom of movement. The report also highlights the importance of increasing the participation of Roma and Travellers in public life and decision-making processes. A number of concrete steps to be taken by governments are mentioned in the report, including providing targeted training to the police to prevent misconduct; desegregating schools and improving the quality of education received by Roma and Traveller children. The Commissioner also recommends that truth commissions be created – ideally as a Europe-wide undertaking – to establish the historical facts concerning the atrocities committed against the Roma people. A summary of the report is also available in French and Romani. Pristina, 24 February 2012 – The Head of the OSCE Mission in Kosovo, Ambassador Werner Almhofer, expressed today his concern over recent security incidents affecting the Kosovo Serb community in the Gjilan/Gnjilane region, eastern Kosovo. Earlier this week, on 20 February, a house belonging to a Kosovo Serb family in Gjilan/Gnjilane town centre was set on fire for the second time in the past seven months, while two houses belonging to Kosovo Serbs in Cërnicë/Cernica village were set on fire in January. All three properties were uninhabited. The OSCE Mission in Kosovo is mandated with human and communities’ rights protection and promotion. La Commission européenne contre le Racisme et l’intolérance (ECRI) du Conseil de l’Europe vient de publier son nouveau rapport sur le Luxembourg. Dans ce rapport, qui couvre la période jusqu’au 23 juin 2011, l’ECRI s’inquiète des mesures arbitraires et discriminatoires envers les Roms roumains qui viennent mendier au Luxembourg et demande aux autorités de prendre des mesures pour mettre fin aux discriminations des gens du voyage par les gérants des parkings. « 94. Il n’y a pas de citoyens luxembourgeois qui se déclarent comme étant Roms. L’ECRI a été informée qu’il y aurait quelque 500 personnes sédentarisées qui ne souhaitent pas être identifiées en tant que Roms. Les autorités luxembourgeoises ont indiqué à ce sujet que selon l’annexe de la communication de la Commission européenne du 5 avril 201116 en la matière, ce chiffre serait une estimation maximale et que l’estimation moyenne serait plutôt de 300 personnes. Les Roms que l’on trouve au Luxembourg sont pour la plupart des demandeurs d’asile provenant des Balkans, les autres étant des personnes installées en France voisine, qui se déplacent pour des périodes de courte durée vers le Grand-Duché. L’ECRI a été informée que la mendicité n’étant plus interdite au Luxembourg, les Roms sont souvent arrêtés pour mendicité en réunion en vertu de l’article 342 du code pénal.17 Selon des chiffres fournis à l’ECRI par les autorités, en 2008, 639 procès-verbaux ont été dressés et en 2009, 1639. De plus, en 2010, 59 procès-verbaux ont été dressés pour mendicité en réunion et vagabondage. Il semblerait que les Roms arrêtés pour mendicité en réunion soient fouillés et leur argent confisqué, mais que la plupart des affaires sont classées sans suite. On peut donc se poser la question du bien fondé de ces arrestations. La police a informé l’ECRI que lorsqu’elle transmet les dossiers au Parquet, elle n’a pas d’informations sur la suite donnée. Une meilleure coordination entre le Parquet et la police serait donc souhaitable. 95. L’ECRI a été informée que les Roms souffrent de discrimination de la part de gérants de campings qui leur y refusent l’accès.18 Des aires de stationnement spécialement instaurées pour les Gens du voyage n’existent pas non plus. L’opinion publique luxembourgeoise semble également quelque peu hostile aux Roms puisqu’une étude parue en août 2010 indique que 26% des personnes interrogées ne souhaiteraient pas en avoir comme voisins alors qu’ils sont très peu nombreux au Luxembourg. 96. L’ECRI recommande aux autorités luxembourgeoises de s’assurer que soient clairement définis les critères relatifs à la mise en oeuvre de l’article 342 du code pénal sur la mendicité en réunion. Elle leur recommande vivement de s’assurer que toute mesure prise par la police pour combattre la mendicité en réunion ne stigmatise pas et ne vise pas injustement les Roms. L’ECRI recommande aux autorités luxembourgeoises de lutter contre toute discrimination envers des Roms par les gérants de campings. Dans ses commentaires, le gouvernement luxembourgeois apporte des précisions sur le traitement des mendiants roms. Les développements de l’ECRI en relation avec les Roms suscitent de la part du gouvernement un certain nombre d’observations. Il convient de préciser que les chiffres dont fait état l’ECRI ne se rapportent pas aux procès-verbaux dressés à l’encontre de Roms, mais à l’ensemble des procès-verbaux établis pour ce type d’infractions. Les fouilles et saisies pratiquées dans le cadre de la lutte contre la mendicité en réunion le sont en vertu des articles 31 et 40 du Code d’instruction criminelle aux termes desquels en cas de délit flagrant puni d’emprisonnement la Police saisit tout ce qui paraît avoir été le produit de l’infraction, tout ce qui paraît utile à la manifestation de la vérité ou dont l’utilisation serait de nature à nuire à la bonne marche de l’instruction et tout ce qui est susceptible de confiscation ou de restitution. La Police applique les dispositions pertinentes du Code d’instruction criminelle sans égard aux origines de la personne concernée. La police a informé l’ECRI que lorsqu’elle transmet les dossiers au Parquet, elle n’a pas d’informations sur la suite donnée. Une meilleure coordination entre le Parquet et la police serait donc souhaitable. Chachipe se félicite des recommandations de l’ECRI et espère que le gouvernement luxembourgeois leur donnera rapidement suite. 16 Communication de le Commission au Parlement européen, au Conseil, au Comité économique et social européen et au Comité des régions, Cadre de l’UE pour les stratégies nationales d’intégration des Roms pour la période allant jusqu’à 2020, Bruxelles, le 5.4.2011, COM(2011)Final. 17 Selon l’article 342 du code pénal, seront punis d’un emprisonnement de huit jours à un mois, tous ceux qui mendieront en réunion, à moins que ce ne soit le mari et la femme, le père ou la mère et leurs jeunes enfants, l’aveugle ou l’invalide et leur conducteur. 18 L’article 167 du Code de la route interdit le stationnement d’une roulotte non accouplée sur la voie publique ainsi que l’utilisation comme logis d’un véhicule en stationnement ou parqué sur la voie publique. Sarajevo, 30 December 2011 – Muqishta Nuqi has long felt like the odd one out in his family. For years, the ethnic Roma has lacked a nationality and lived under the threat of being expelled from Bosnia and Herzegovina, his home for almost two decades. But the asylum-seeker has never given up in his determination to become a Bosnian citizen, like his parents and siblings, and his persistence is paying off. After consistent efforts by Nuqi and UNHCR, the Bosnian government recently granted temporary residence to the 35-year-old and his children, based on his ownership of property in Sarajevo. This means he can legally reside in the country, but must reapply every year for temporary residence, which does not entitle him to basic rights such as health care and financial support. After three years he can apply for Bosnian citizenship and all the many rights that go with it. Nuqi’s success is an exception, but Bosnia’s Citizenship Law is under review and UNHCR hopes that hundreds of other vulnerable families could soon reap the benefits and be granted citizenship of the country, which was torn by conflict in the 1990s amid the break-up of the former Yugoslavia. His family hailed from Djakova in western Kosovo, but they moved to Sarajevo, the capital of Bosnia and Herzegovina, when he was a child. He had a happy upbringing in the hill-circled city, though he was never registered as a resident like other members of his family. In 1992, all-out conflict returned to the Balkans for the first time since World War II and Nuqi fled to Kosovo with his mother and several siblings. The rest of his family remained in Sarajevo, where Nuqi’s uncle was killed in the fighting. But a few years later Kosovo was also embroiled in violence and persecution, which only ended with the March-June 1999 NATO (North Atlantic Treaty Organization) bombing campaign against Yugoslav government targets. Forced by paramilitary fighters to leave their home, Nuqi and his family headed back to Bosnia, where he was granted temporary admission status, like other Roma fleeing from Kosovo. It gave them access to aid, shelter, education and health care. He moved to join his family in a Roma settlement in Sarajevo, where he has lived ever since and invested in property. He earns a good living from collecting and selling waste material. But uncertainty returned to Nuqi’s life in 2007, when he faced being sent back to Kosovo – his last place of registered residence – and separation from his family, after the government revoked his temporary admission status. In 2009, he applied for asylum, but this was rejected and he filed an appeal with the help of UNHCR. “I have no one in Kosovo. My parents, siblings and relatives are all citizens of Bosnia and Herzegovina. Six of my [nine] children were born here, they go to school here. I built my house with my own hands and have always abided by the law,” Nuqi told UNHCR. “All I have ever wanted was to be recognized as a citizen of this country,” he added. He faced an uphill battle challenging the government’s ruling because, like other Roma in a similar situation, he was not a resident of a reception centre for asylum-seekers and thus ineligible for legal or financial support from the government. Moreover, he was also legally barred from employment, though this was essential to support his family. But Nuqi was determined and, even though illiterate and unable to read them, he spent time, effort and money on collecting and filing documents to back his case to remain in Bosnia and gain citizenship and to show that he was a good, law-abiding member of society who deserved this recognition. He was supported in his efforts by UNHCR and the Council of Europe, whose Commissioner for Human Rights Thomas Hammarberg met Muqishta a year ago and called on the Bosnian government to do more to find durable solutions for the forcibly displaced, including local integration. “Particular attention should be paid to Roma who have been forcibly displaced from Kosovo and have lived, for many years, with their families in Bosnia and Herzegovina. Return is not a real option for these people. They are still in need of international protection,” the Swedish humanitarian said. The signs for change are good. In Belgrade earlier this month, the governments of Bosnia and Herzegovina, Croatia, Montenegro, and Serbia gave their firm support to a work plan setting out concrete steps for removing all obstacles to a durable solution for the remaining refugees from the Balkans conflict of 1991-1995. These include the accelerated provision of civil documentation allowing people to enjoy their rights and resume normal lives. In Bosnia, the Ministry of Civil Affairs has started drafting proposed amendments to the Citizenship Law, which will make it easier for refugees and the stateless to get nationality. Naveed Hussain, UNHCR’s representative in Bosnia and Herzegovina, said he was optimistic that the law would help to improve the lives of many who face renewed displacement despite having long-term residence and strong family ties to Bosnia . “Mr Nuqi and people in his position should be able to become Bosnian citizens and stay here permanently,” he stressed. Strong measures have been taken by the Macedonian authorities to prevent citizens from travelling to EU countries – and seeking asylum there. The numbers doing so have gone up considerably since the EU agreed that people in Balkan countries would no longer require visas to enter EU territory. Governments within the EU have reacted and warned that the entire process of visa liberalisation might now be in jeopardy. 22/11/2011 – In response the government in “the former Yugoslav Republic of Macedonia” has decided to criminalise “abuse of the European Union visa-free regime and of the Schengen agreement”. It has also determined that those who have been forcibly returned as failed asylum seekers could have their passports temporarily confiscated. Other countries in the region have also taken steps to prevent certain people from travelling to EU countries. Those who seek to leave for the EU area are asked to justify the purpose of their intended travel and to prove that they can finance their stay there as well as their return. If the answers are deemed unsatisfactory the travel may not be allowed. In the present anti-migrant climate, it should not come as a surprise that EU countries have reacted to the increase in asylum requests. In 2010 – the first year after the visa liberalisation – Sweden received 7,900 applications from persons coming from Serbia while Germany and France received 6,500 and 5,800 respectively. So far this year the numbers are lower. Almost all decisions on these applications have been negative. This is the background to the pressure exerted on the countries of origin – and to their response. However, the concrete measures taken do raise some serious problems. Though states have a legitimate authority to regulate immigration, the right of the individual to leave his or her country is an established human right. This right was guaranteed already in the Universal Declaration of Human Rights. “Everyone shall be free to leave any country, including his own”, is the formulation used in the European Convention on Human Rights (Protocol 4, Article 2). This right is also protected in the constitutions of states in the Balkans. Even if no formal ban on leaving has been decided, the exit procedures now being introduced and the risk of penalties on return may in reality have such an effect. Significantly, it is the minorities, and in particular the Roma, who have become targeted. Everyone cannot be checked on exit and the selection is being done on the basis of “profiling”. The result is another layer of discrimination against this minority. This is further amplified by the notion in public discourse that the visa-exempt status may be withdrawn because of the movement of Roma people. In other words, they are scapegoated again. The pressure from the European Union has been justified by references to the need to stop networks of organised migrant smuggling. It is certainly important to put an end to exploitation and manipulation by smugglers. However, such practices appear not to be the typical pattern in this case. Many of those who have moved and sought asylum within the EU have done so on their own initiative and because of a genuine experience of physical and/or economic insecurity. They have wanted to get away from injustices and/or poverty and abject misery. The fact that the Roma are overrepresented in this category only reflects their real situation in the region. The increase in asylum applications in some countries is a symptom rather than the core problem. It represents another sign that Europe has failed to break the cycle of anti-Gypsyism, discrimination and marginalisation of Roma populations. It should be seen as a reminder that serious action is overdue. It is obvious that even if and when the necessary political will for effective action for minority rights is mobilised, it will take considerable time before the root causes of these problems are eradicated and Roma families no longer feel the urge to seek a future abroad. In the meantime, any discriminatory treatment of the Roma must be avoided by the destination countries. Seeking asylum is a human right and those who have grounds for protection status should be granted such status. Others will have to accept a negative decision. Measures such as improved dissemination of information about the asylum rules in the Schengen area would be constructive. However, pressure on Balkan governments to undermine the human right of their citizens to leave their country is not. 12 November 2011 – On 10 November 2011, hearing on Human Rights in the Western Balkans at the European Parliament. The hearing was organised by the Sub-Committee on Human Rights in the context of the preparation of the parliament report on the progress made by the countries of the Western Balkans in the context of the Enlargement process. In its presentation, Chachipe underlined the prevailance of discrimination and human rights violation against Roma in all the countries. The organization focused on the situation of Roma refugees and IDPs and on the consequences of the restrictive measures taken by the countries in order to reduce the number of asylum seekers from the countries of the Western Balkans. In the subsequent debate, Chachipe pointed out that many of those who are currently applying for asylum in the EU are Roma refugees and IDPs from Kosovo or former forced returnees from Western Europe, in particular from Germany. Chachipe agreed with the statement of an MEP, who pointed out at the responsibility of the countries of the Western Balkans towards their Roma citizens, but asked whether it is acceptable to deport foreign born children to the country of their parents or grand-parents.